Moto-I's award winning Abura Ramen. They had us at “sake brewery;” but discovering that Moto-I in uptown Minneapolis also specializes in Asian street food made it a completely irresistible stop for us. Anyone who has followed our travels for any length of time knows we like our drink: beer, wine, scotch, bourbon – it’s all good. We enjoy sake, too, but haven’t really had it often enough to know much about it. What better place to learn, we figured, than at the first sake brewery and restaurant outside of Japan? Brewed like beer but with a flavor more akin to wine, sake is like no other beverage. It’s light, smooth, and slightly sweet flavor belies a powerful punch, normally weighing in at 30 to 40 proof. This is a drink best savored slowly. Luckily we had plenty of time. For the uninitiated, like us, the variety and styles of sake derived from the humble rice grain are a bit dizzying. There are 65 different strains of sake-grade rice, different milling standards, filtration, and aging practices, all described using a ‘foreign’ nomenclature. It’s quite frankly, still Japanese to us. Fortunately Moto-I’s helpful bartender served as translator and tour guide to their line-up of ‘namasake’ – unpasteurized draft sake. We sampled four of their drafts, ranging from the ‘cask strength’ Junmai Genshu to the blended and unpressed Junmai Nigori. The differences among the group were more subtle than our typical wine, beer, or liquor tasting. Slight variations in sweetness, a hint of pear, a touch of floral, a little more texture, is what stood out from one glass to the next. All were delicious. I preferred the slightly dryer cask strength Junami Genshu while Shannon opted for the delicate honeydew flavors of the Junami Nama. Small preferences aside, we’d gladly take any of the four home. If only Moto-I offered to-go cups or growlers we’d really be in business. 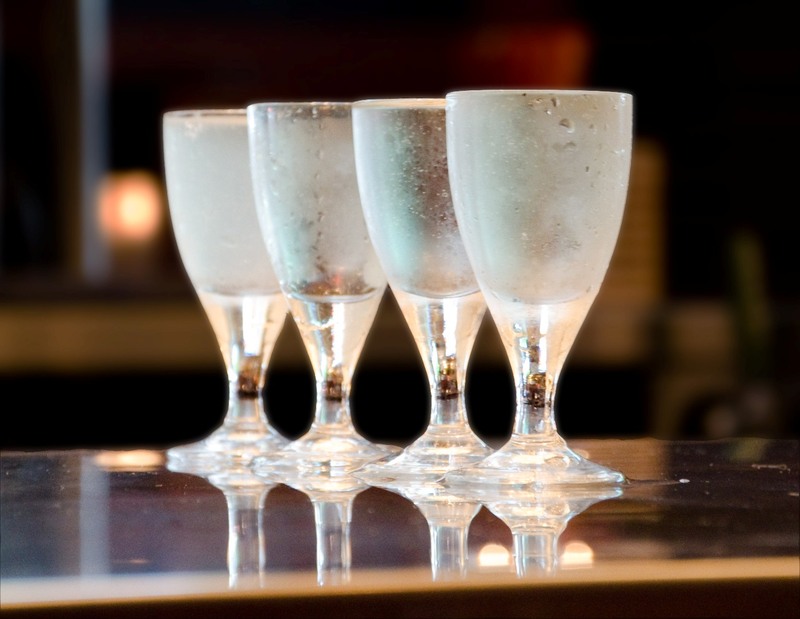 Strong drink on an empty stomach is a no-no, so we paired our sake flight with Moto-I’s award-winning Abura Ramen. Literally translated to mean ‘oily noodle,’ their Abura Ramen includes healthy amounts of pork fat and chili oil, making for a heartier dish than the more typical Ramen soup. 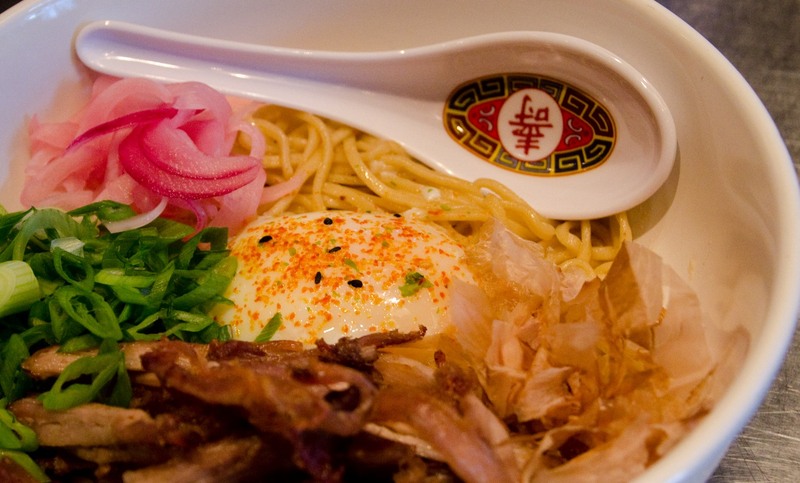 Mixed together with fried egg, smoked pork, ponzu scallions, and pickled red onions, this Ramen was off the hook – and more than enough of a base to support our sake. Good enough, even, for another round. I didn’t know they had saki breweries. Sounds delicious! We didn’t either – or at least ones you could visit and get samples. We’ve visited (and are visiting) beer breweries and brew-pubs all around the country. It’s always nice to mix things up like this. You know what? I’ve never tried it! But I would love to! With 65 different variations where does one start? I’d love to do a Sake testing. I still haven’t tried it!